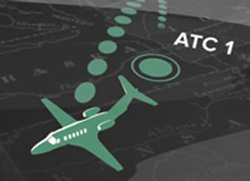 At the upcoming NBAA 2013 – Business Aviation Convention & Exhibition in Las Vegas, Nevada, Duncan Aviation will present expert advice and guidance through the ever-changing and complex subject of Future Air Navigation Systems (FANS). This one-hour session called “Understanding FANS” will be presented by Duncan Aviation Avionics Sales Representative, Justin Vena, on Wednesday, October 23, during the show. Attendees will be briefed on the evolution of FANS, how FANS operates, certification and upcoming mandates. Justin will explain Controller Pilot Data Link (CPDLC), Automatic Dependent Surveillance Contract (ADS-C) and how they operate, including details about what happens with initial set-up and operation, including air traffic controller hand-offs, and explain the components included in a typical system. The session will also address FANS mandates in Europe and the North Atlantic tracks. FANS 1/A+ is a complex subject, with each aircraft requiring its own unique solution. Because of this complexity, operators have a lot of questions and expert advice is in demand. Duncan Aviation has been instrumental in the development of several resources to assist operators as they work through what is needed for FANS 1/A+ compliance. With a Straight Talk ebook, a video series, a webinar, multiple blog posts and Duncan Intelligence articles, FANS information by Duncan Aviation has been read and downloaded thousands of times by operators throughout the world. All of these resources provide current information on the evolution of FANS, how FANS operates, certification and upcoming mandates. In addition, Duncan Aviation offers information and advice regarding FANS operations, and answers the most common questions that operators are asking. For more information, please visit Duncan Aviation at booth #C8543 at NBAA 2013 held Oct. 22-24 in Las Vegas, or watch for announcements at www.DuncanAviation.aero/nbaa.